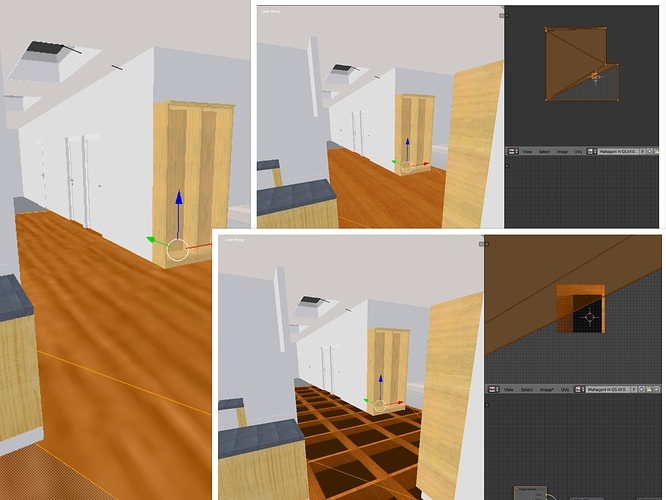 I have a problem with baking in blender cycles: I have an interior model and every part of it uses repeating texture (the floor for example uses a 256x256 texture which repeats itself). My aim is to bake the texture so it includes shadows and lighting. As soon as I UV unwrap e.g. the floor, the UV grid only uses the 256x256 texture one(!) time. I can scale the selection in the UV editor so it looks good on the object editor but this seems to only affect the view. I also tried checking the repeat option, but after baking, the baked texture gets repeated as well (when scaled, only a part of it). Hope this seems understandable, I’m relatively new to blender. Yeah, what you normally need in this situation is a second UV map with the whole mesh laid out. Naturally, this would need to be a larger resolution. These may point you in the right direction.